Cumberland Academy High is fully accredited and meets all state standards and annual expectations. We pride ourselves on having the most knowledgeable and caring teachers who teach the whole child. With student to teacher ratios lower than the state average, our teachers are able to get to know your child and forge a partnership with your family. Like you, we want your student to be successful! Our curriculum includes core classes such as English Language Arts, Reading, Math, Science, and Social Studies. Students are able to explore their passions in elective classes such as Accounting, Graphic Design, Theatre, Culinary Arts, Criminal Investigation, and Business Information Management. We also offer American Sign Lanaguage as well as Spanish. Students are required to declare an endorsement in writing. They will be able to change their endorsement with written notification from their parents. Cumberland Academy High offers five endorsement options, giving students flexibility based on individual interests and career goals. 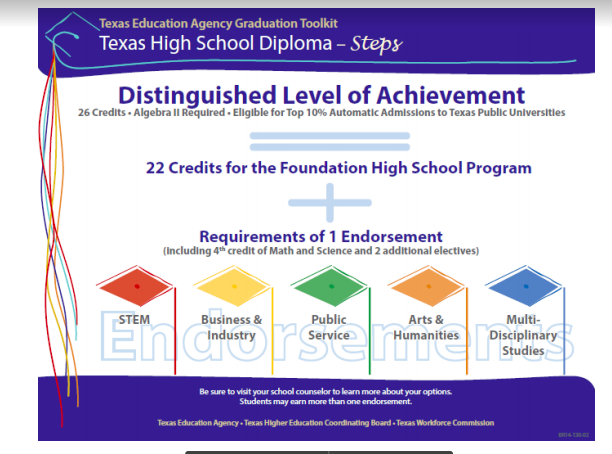 Each endorsement category is designed to prepare students to successfully enter post-secondary education or the workforce upon graduation from high school. Click on the pathway to see the sequence of courses to attain the endorsement.